× Do you have a Church record for a Phillips family or one where a Phillips is mentioned and want to share it? If you are a registered user of this website and forum, please feel free to share them here! Do you have another type of record and feel we need a new category? Just let the administrator know and we will create one. On June 10th, 1785, 16 members met in a mill on this site owned by Joel Phillips, a Revolutionary soldier, and organized Phillips Mills Baptist Church. The Rev. Silas Mercer, leader of the group, became the first pastor of the church, and served in that capacity for 11 years. His son, Jesse Mercer, was received into the church on July 7, 1787, at the age of eighteen. Later he was ordained to the ministry in the old church, and followed his father as its pastor, serving this church for thirty-seven years. 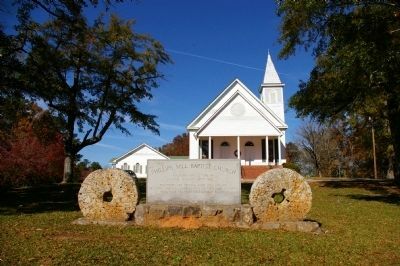 Photo, by David Seibert, 2009, attached: Phillips Mill Baptist Church, Millstones are original from Joel Phillips' grist mill and were imported from the Paris Basin in Europe.